This is a reference book to help you meet the needs of disabled children. You need not read it from cover to cover. Use it to look up particular information as you need it. To learn how the book is organized, and why, we suggest you read ABOUT THIS BOOK at the beginning. Also, please read the introduction to each of the 3 main parts of the book. These chapters have page edges with a short black line, to help you find the beginning of PARTS 1, 2, and 3. To work more effectively with disabled children, we strongly suggest that you read the first 5 chapters of PART 1. These will help you to examine a child, to identify different disabilities, and to keep important records in an easy way. Check the list of CONTENTS at the beginning of the book. This tells you what each chapter is about and gives the page numbers. Throughout the book you will find this symbol in the margin of some pages. It appears where there is information for cerebral palsy. If you want more information than is in this book, see the list of books and teaching materials entitled REFERENCES (Where to Get More Information), Page 637. If you do not know what some words mean, look in the LIST OF SPECIAL OR DIFFICULT WORDS, Page 643. Words explained in this LIST are written in italics when first used in a chapter. IMPORTANT: To find all the information you will need for one disabled child, you will usually need to look in several different chapters. To know where to look, follow the page references shown. These are explained inside the back cover. * Asterisk: This little star is called an asterisk. It is used to indicate that there is more information about a word or an idea at the bottom of the page. For more information on how to use this book, see the inside of the back cover. This book is an attempt to pull together basic information to help you meet the needs of village children with a wide range of disabilities. We have done the best we can, given our limitations. We know the book is not perfect and that it has weaknesses and perhaps some mistakes. We urge anyone reviewing or using the book, whether a disabled person, parent, health worker, or professional, to send us all your criticism and suggestions. Help us to make improvements for a later edition. Thank you. This book has been a cooperative effort. Many persons have contributed in different ways. Some have helped to write or rewrite different sections. Some have criticized early drafts; Some have used it in their programs and sent us feedback; Some have sent original ideas or technologies that we have tested and then included. In all, persons or programs from 27 countries on 6 continents (North and South America, Africa, Asia, Europe, Australia) have contributed. Sophie Levitt, PT; Ann Hallum, PT; Terry Nordstrom, PT; Anne Affleck, OT; Mike Miles, rehab planner and critic; Christine Miles, special educator; Farhat Rashid, PT; Bruce Curtis, peer disabled group counselor; Ralf Hotchkiss, wheelchair rider/engineer; Alice Hadley, PT; Jan Postma, PT; Jean-Baptiste Richardier, prosthetist; Claude Simonnot, MD/prosthetist; Wayne Hampton, MD/prosthetist; Jim Breakey, prosthetist; Wally Motlock, orthotist; Valery Taylor, PT; Dr. P. K. Sethi, orthopedic surgeon/prosthetist; Pam Zinkin, pediatrician/CBR expert; Paul Silva, wheelchair builder; David Morley, pediatrician; Elía Landeros, PT; Teresa páez, social worker; Rafiq Jaffer, rehab specialist; Kris Buckner, parent of many adopted disabled children; Barbara Anderson, PT; Don Caston, rehab engineer; Greg Dixon, Director, Partners' Appropriate Technology In Health; Susan Hammerman, Director, Rehabilitation International; Carole Coleman, specialist in sign language; Suzanne Reier, recreation therapist; Sarah Grossman, PT; Donald Laub, plastic surgeon; Jean Kohn, MD in rehabilitation; Bob Friedricks, orthotist; Katherine Myers, spinal cord injury nurse; Grace Warren, PT in leprosy; Jean M. Watson, PT in leprosy; David Sanders, pediatrician; Jane Neville, leprosy expert; Stanley Browne, MD, leprosy; Alexandra Enders, OT; John McGill, prosthetist; Victoria Sheffield, Rita Leavell, MD, Jeff Watson, J. Kirk Horton, Lawrence Campbell, Helen Keller International; Owen Wrigley, IHAP; Roswitha and Kenneth Klee, Winfried Lichtemberger, Jeanne R. Kenmore, Christoffel Blindenmission; Judy Deutsch, PT; Jane Thiboutot, PT; R. L. Huckstep, MD; Linda Goode, PT; Susan Johnson, PT; David Hall, child health consultant; Ann Goerdt, PT for WHO; Mira Shiva, MD; Nigel Shapcott, seating specialist; Ann Yeadon, educator; Charles Reilly, sign language consultant; Eli Savanack, Gallaudet College; John Gray, MD; Molly Thorburn, MD; Lonny Shavelson, MD; Margaret Mackenzie, medical anthropologist; Rainer Arnhold, MD; Gulbadan Habibi, Caroline Arnold, Philip Kgosana, Garren Lumpkin, UNICEF. Above all, We would like to thank the team of disabled village rehabilitation workers in Project PROJIMO, Ajoya, Sinaloa, Mexico, along with the hundreds of disabled children and their families. Their involvement and interaction in exploring, testing, inventing, and discovering simplified alternatives has led to the formation of this book. Key among the PROJIMO team are: Marcelo Acevedo, Miguel Alvarez, Adelina Bastidas, Roberto Fajardo, Teresa Gárate, Bruce Hobson, Concepción Lara, Inés León, Ramon León, Polo Leyva, Armando Nevárez, María Picos, Adelina Pliego, Elijio Reyes, Cecilia Rodríguez, Josefa Rodríguez, Concepción Rubio, Moisés Salas, Rosa Salcido, Asunción Soto, Javier Valverde, Florentino Velázquez, Efrain Zamora, Miguel Zamora. For this book we have borrowed information, ideas, illustrations, methods, and designs from many sources, published and unpublished. Often credit has been given, but not always. If you notice we have 'borrowed' from your material and neglected to give you credit, please accept our unspoken thanks and apologies. For their excellent and dedicated work in preparing the manuscript for publication, special thanks go to: Jane Maxwell, editing, page design, and art production; Irene Yen, editing and paste-up; Kathy Alberts, Elizabeth de Avila, Martín Bustos, Mary Klein, Carlos Romero and Marjorie Wang, paste-up; Martín Bustos and Anna Muñoz-Briggs. Spanish translation; Myra Polinger, typing; Lynn Gordon, Bill Bower, Phil Pasmanick and Dan Periman, general review; Alison Davis, reference section research; Elizabeth de Avila, Don Baker, Agnes Batteiger, Jane Bavelas, Leda Bosworth, Renée Burgard, Michael Lang, Betty Page, Pearl Snyder, Tinker Spar, Paula Tanous and Roger Wilson, proofreading; Lino Montebon, Joan Thompson and David Werner, drawings; Richard Parker, John Fago, Carolyn Watson, Tom Wells and David Werner, photography; Dyanne Ladine, art production; Martín Bustos and Richard Parker, photo production; Hal Lockwood and Helen Epperson of Bookman Productions, Tim Anderson and Linda Inman of Reprographex, typesetting and layout; and Trude Bock for giving so wholeheartedly of herself and her home for the preparation of this book. We want to give an extra word of thanks to Carol Thuman for coordination, typing, and correspondence and Janet Elliott for graphics, artwork, and paste-up, and to both for sharing the responsibility for the preparation and quality of this book. The main costs of preparing this book were met by grants from the Public Welfare Foundation, whose continued friendship and support of the Hesperian Foundation's new publications is deeply appreciated. Additional funding was generously provided by the Gary Wang Memorial Fund, UNICEF, OXFAM UK, the Swedish International Development Agency, and MISEREOR. We would also like to thank the Thrasher Research Fund and Mulago Foundation for helping meet the costs of Project PROJIMO, from which this book evolved. For this third printing, we would like to thank Manisha Aryal for coordination; Martín Bustos for meticulous research; Susan McCallister for copy editing and careful proofreading; and Elena Metcalf for page layout and proofreading. Finally, we would like to thank David Werner for his careful and hard work in preparing this book. His vision and advocacy for disabled people around the world is reflected throughout the book. Usually the chapter that discusses a specific disability will not include all the information necessary to meet a child's needs. You will also have to look in other chapters. There are several ways to find out where to look. As you read a chapter, often you will come to page references such as "(See Page 471)." This means that you can turn to page 471 for more information on the topic being discussed. To find all the different places in the book that give important information about a specific disability or topic, use the INDEX. It is very important that you learn how to look up these references, and do so. If you do not, the information to meet a child's needs will not be complete. REMEMBER: The best way to learn how to use this book is to work for a while with the guidance of experienced rehabilitation workers. 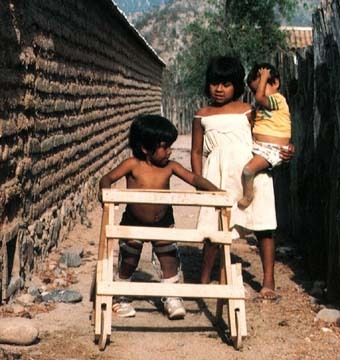 Homemade wheelchairs and wheel boards. Disabled Village Children is a book of information and ideas for all who are concerned about the well - being of disabled children. It is especially for those who live in rural areas where resources are limited. But it is also for therapists and professionals who assist community-based programs or who want to share knowledge and skills with families and concerned members of the community. Written by David Werner with the help of disabled persons and pioneers in rehabilitation in many countries, this book has been prepared in a style and spirit similar to the author's earlier works, Where There Is No Doctor and Helping Health Workers Learn. It gives a wealth of clear, simple, but detailed information concerning most common disabilities of children: many different physical disabilities, blindness, deafness, fits, behavior problems, and developmental delay. It gives suggestions for simplified rehabilitation, low-cost aids, and ways to' help disabled children find a role and be accepted in the community. Above all, the book helps us to realize that most of the answers for meeting these children's needs can be found within the community, the family, and in the children themselves. It discusses ways of starting small community rehabilitation centers and workshops run by disabled persons or the families of disabled children. Over 4,000 line drawings and 200, photos help make the information clear even to those with little formal education. 1. Medicine, Popular - Handbooks, manuals, etc. 2. Rehabilitation - Handbooks, manuals, etc. 3. Community Health Aids - Handbooks, manuals, etc. The Hesperian Foundation encourages others to copy, reproduce or adapt to meet local needs, any or all parts of this book, including the illustrations, provided the parts reproduced are distributed free or at cost-not for profit. Any organization or person who wishes to copy, reproduce, or adapt, any or all parts of this book for commercial purposes, must first obtain permission to do so from the Hesperian Foundation. Please contact the Hesperian Foundation before beginning any translation or adaptation to avoid duplication of efforts, and for suggestions about adapting the information in this book. The Foundation would appreciate receiving a copy of any materials in which text or illustrations from this book have been used. Copyright (c) 2007-2009 Japanese Society for Rehabilitation of Persons with Disabilities（JSRPD）All Rights Reserved.